Designed, manufactured, and assembled in Canada, and tested under our harshest conditions. We have redesigned this tripod from the ground up to make sure it has everything you need for nature photography, especially suited for Jobu Design gimbal head use. This tripod incorporates all the strong and lightweight design characteristics of the robust Jobu Design line. Its versatile features allow for variety of shooting setups, whether it be flat to the ground, 5 feet up, and anything in between. If you have a Jobu Design gimbal head, the Algonquin tripod is its perfect partner. Solid billet machined top-platform, not crumbly cast aluminum. 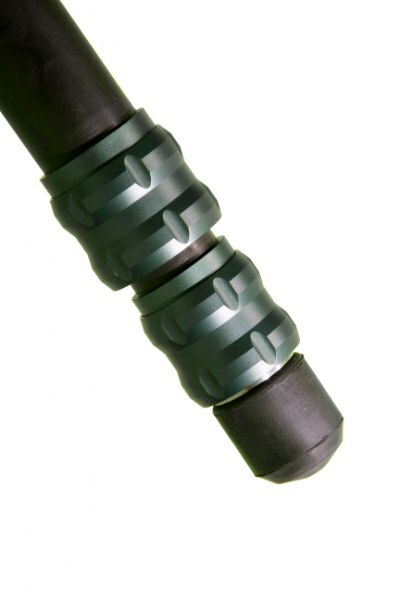 Rubber tip covers (pull on/off). Easily replaceable. Includes 3x 1/4" set screws for securing accessories or ballheads. Includes a light-duty nylon 'camo' dust-cover bag with carry-strap. Standard 5 year warranty - although we fully expect a much longer life with these products. We cannot however accept returns or exchange tripods for cosmetic reasons (changes in color, nicks, scratches, regular wear-and-tear, etc.) and cannot cover any damage caused by traumatic events, or abuse or misuse (or sheer stupidity like our extreme testing below). Further Note on the 5-Year Warranty. Tripods must be cleaned by the user after immersion in water, muddy water, salt-water or any combination of those elements before being left to dry out. A tripod that is seized-up due to negligent care is not covered by our warranty. Shipping cost to and from our factory + 2 hours of shop labour ($150+shipping) will be charged for cleaning a tripod and replacing worn and damaged components. Follow our YouTube video on how to clean your tripod and be happy! The angles of the tripod can be set at standard 55, 25 and 5 degree angles. The Algonquin tripod can be used almost flat to the ground, allowing for a wide range of shooting levels. I recently purchased a Jobu Algonquin tripod, and have to say that it has exceeded my expectations. It has a build quality is first rate and is rock solid stable. And, best of all, its lightweight makes it a delight to take into the field. Anyone looking for a very well engineered tripod owes it to themselves to give the Algonquin a serious look. I've been using the Jobu Algonquin tripod for 4 months now. At -20 degrees the tripod is working amazingly well. I love everything about it; the light weight and the stability makes it a very impressive tripod, for a lot less money than its competition. Combined to my Jobu Jr. gimbal head, this combo is all I need when in the field. I purchased the Algonquin tripod two months ago prior to a trip to Utah, California, and Wyoming. We photographed in Rocky Mountain NP, Arches, Natural Bridges, Antelope Canyon, Zion, Bryce, Seqouia, Yosemite (got rained out), Death Valley, and Yellowstone. I had the chance to use the tripod at home for two weeks prior to the trip. All features of the tripod worked flawlessly. I bought a Really Right Stuff leveling head to use with the Mark IV gimbal head which I had also purchased from Jobu. On the trip, which lasted five weeks I took many land scapes, panoramas, and wild life images. I put some indexing marks on the gimbal head and was able to take double row panoramas. I used a nodal bar an could mount my camera on the gimbal head with a short lens. I used a Canon MarkIII with a 24-70 2.8, 24-105 and a 100-400. I was able to easily set up for photos and the tripod and gimbal head were extremely stable and adaptable to all situations. I used the set up in Bryce in four inches of snow, Death Valley at over 105 degrees and in Yosemite in fog and rain. All of the equipment functioned flawlessly. The locks on the tripod were very secure and never slipped in any way. At one time after an 18 mile combination mountain bike ride and hike (tripod in a backpack) to photograph the Wahweep Hoodoos. I did get some sand in the tripod legs. Afterwards I was able to easily diasemble the locks and clean the sand from the legs. The tripod was extremely stable and my images turned out very well. Everywhere I went the tripod and gimbal head attracted attention from fellow photographers. All were greatly impressed with the quality and performance of the tripod and gimbal head. I would highly recommend this set up to anyone using either short or long lens setups. Simply the best tripod system I've ever worked with, bar none. 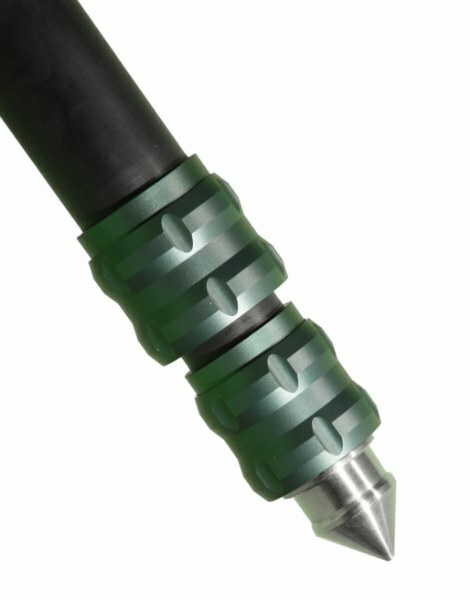 no noticeable vibration, easy to use with gloves the built in ice spikes, easy to clean and super strong. No idea if I was to change it what I would change. Makes every other set of legs I've used pale in comparison.